In yesterday's article, "SDL2: Keyboard and Mouse Movement (Events)", we saw how we could handle keyboard and mouse events to allow the user to interact with whatever we are displaying on the screen. In today's article, we'll learn how to draw individual pixels onto our window, and we'll use mouse events to create a drawing program similar to a limited version of Microsoft Paint. As always, don't forget to put SDL2.dll in the same folder as your executable before running the program. We pass in several parameters. The first one is the renderer, and the last two are the width and height of the texture. 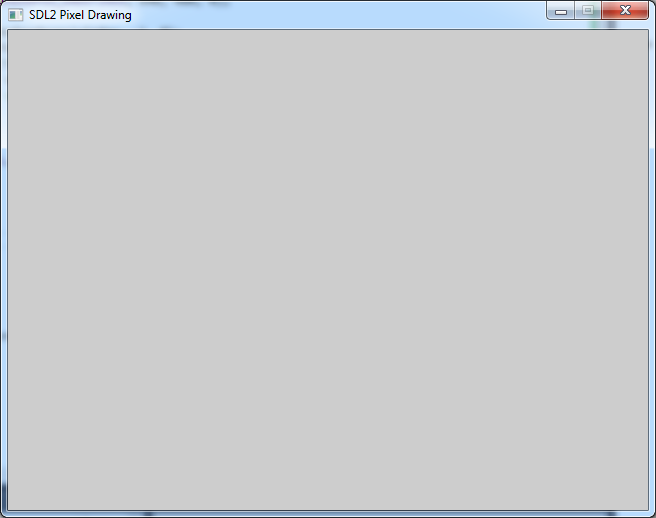 The SDL_TEXTUREACCESS_STATIC defines a method of accessing the texture. Since we're storing our pixels in CPU memory and then copying them over to the GPU, static access is suitable. On the other hand, streaming access is used to allocate pixels in a back buffer in video memory, and that's suitable for more complex scenarios. Finally, we initialise a set of pixels that we'll be copying onto the window. When we draw stuff, we'll modify these pixels, and then they'll be copied onto the window to reflect the update. In this code, we are using SDL_UpdateTexture() to copy our pixels onto the window. We pass it our texture, a region of the texture to update (in our case NULL means to update the entire texture), our array of pixels, and the size in bytes of a single row of pixels (called the pitch). In our case, our window has a width of 640 pixels. Therefore a single row consists of 640 4-byte pixels, hence the multiplication. Right, so we're keeping track of whether the left mouse button is pressed. When it's pressed (SDL_MOUSEBUTTONDOWN), leftMouseButtonDown is set to true, and when it's released (SDL_MOUSEBUTTONUP), leftMouseButtonDown is set to false. If the mouse is moving (SDL_MOUSEMOTION) and the left mouse button is currently down, then the pixel at its location is set to black (or zero, which is the same thing). Note that I intentionally left out a break statement at the end of the SDL_MOUSEBUTTONDOWN case, so that the drawing code in SDL_MOUSEMOTION is executed along with its own. Fantastic! 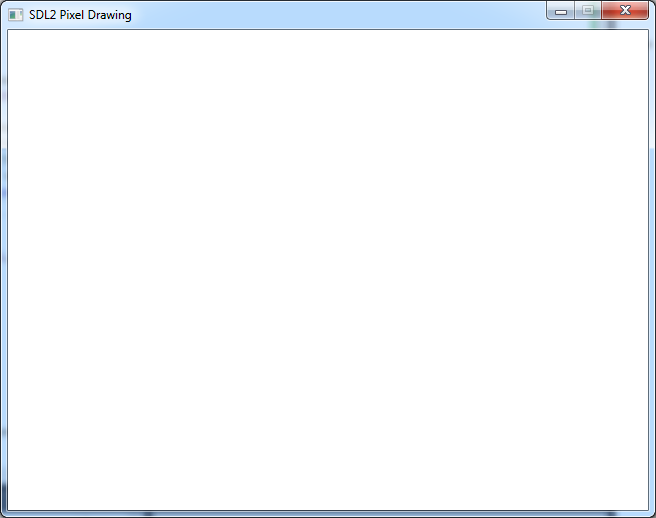 In this article, we learned how to draw pixels directly using SDL2. This involved first creating an SDL2 texture with a specified pixel format, then allocating an array to store those pixels, and finally copying the pixels from the array to the texture. We also used a variety of mouse events to allow the user to actually draw pixels onto the window with the mouse, which is like a simplified version of Microsoft Paint. I get the white screen, but nothing is being drawn on screen when I click around. Also, the program does not exit when I click the red quit button (OSX). Any insight would be appreciated. Hi karadon, I've tried your code on my Windows machine and (except for a missing cast to (Uint32 *) before the call to calloc()) it works fine and draws pixels. What you are seeing may be some bug in SDL2 specific to Mac OS X (or possibly something wrong with your setup... who knows) - I'm guessing it is tripping up with events since it isn't even catching the SDL_QUIT (red quit button). Unfortunately I don't have a Mac setup, so your best bet would be to ask at the SDL Development forum ( https://forums.libsdl.org/viewforum.php?f=1 ) to try and get additional insight into the problem. Oh, what you can also try is... stick an SDL_GetError() at various parts of the program and see whether it gives you anything. 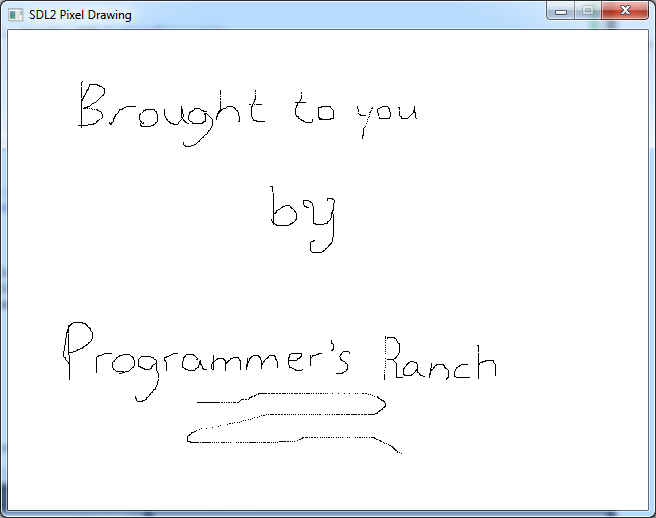 Refer to http://www.programmersranch.com/2013/11/sdl2-displaying-image-in-window.html for how to do this. Isn't it better to make sure to fully process the event queue on each iteration? It's what everyone else seems to do, and it makes sense since updating the texture is an expensive operation (in this context). If you do that, it also works properly on OSX. Right now you wait for >= 1 event, then you process exactly 1 event. If you initially got 2 events, process 1, then get yet another one while updating the texture, you'll still only process 1. It makes sense to put a loop around the switch-case, and poll for events there. You raise a valid point. How does this affect OSX though?